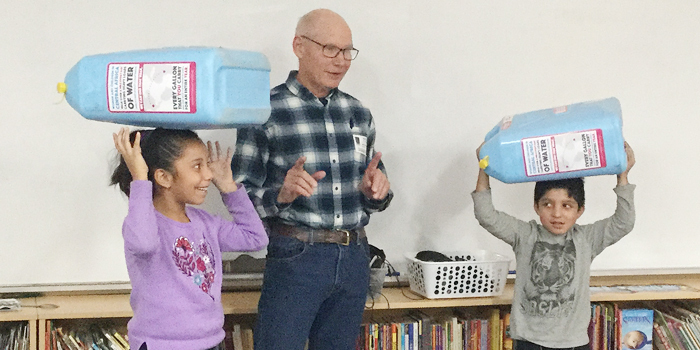 A report on the online news site, InkFreeNews, tells how Jim Hocking, founder of Water for Good, helped educate students at Leesburg Elementary, Leesburg, Ind., about the importance of clean water. A portion of the story appears below. Click here to read the complete article. Water for Good is a cooperating ministry in the Charis Fellowship. Jim Hocking works with students to educate them on how water is carried in the Central African Republic. Second-grade students in Leesburg Elementary School’s English language learners program have been exploring the need for and delivery of clean water. As students read about countries that do not have access to clean water, they gained a greater appreciation for the water that comes out of their faucet every day. The highlight of the unit occurred when Jim Hocking, founder of the non-profit Water for Good, came to the class to share about his organization. Hocking shared with the students how children and adults in the Central African Republic get water from pumps and carry the water to their homes in large jugs on their heads.